Whispers in the Loggia: "Let There Be Light"
Easter is the feast of the new creation. Jesus is risen and dies no more. He has opened the door to a new life, one that no longer knows illness and death. He has taken mankind up into God himself. “Flesh and blood cannot inherit the kingdom of God”, as Saint Paul says in the First Letter to the Corinthians (15:50). On the subject of Christ’s resurrection and our resurrection, the Church writer Tertullian in the third century was bold enough to write: “Rest assured, flesh and blood, through Christ you have gained your place in heaven and in the Kingdom of God” (CCL II, 994). A new dimension has opened up for mankind. Creation has become greater and broader. Easter Day ushers in a new creation, but that is precisely why the Church starts the liturgy on this day with the old creation, so that we can learn to understand the new one aright. At the beginning of the Liturgy of the Word on Easter night, then, comes the account of the creation of the world. Two things are particularly important here in connection with this liturgy. On the one hand, creation is presented as a whole that includes the phenomenon of time. The seven days are an image of completeness, unfolding in time. They are ordered towards the seventh day, the day of the freedom of all creatures for God and for one another. Creation is therefore directed towards the coming together of God and his creatures; it exists so as to open up a space for the response to God’s great glory, an encounter between love and freedom. 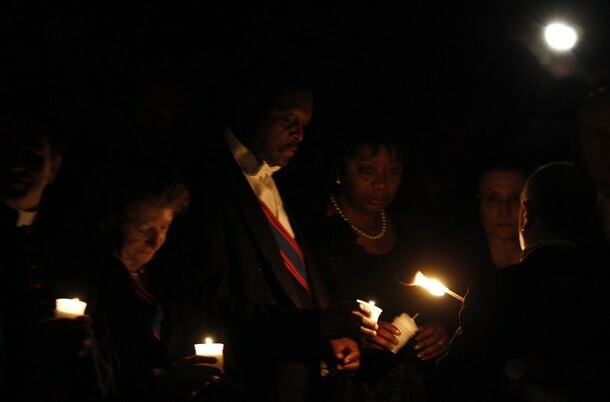 On the other hand, what the Church hears on Easter night is above all the first element of the creation account: “God said, ‘let there be light!’” (Gen 1:3). The creation account begins symbolically with the creation of light. The sun and the moon are created only on the fourth day. The creation account calls them lights, set by God in the firmament of heaven. In this way he deliberately takes away the divine character that the great religions had assigned to them. No, they are not gods. They are shining bodies created by the one God. But they are preceded by the light through which God’s glory is reflected in the essence of the created being. What is the creation account saying here? Light makes life possible. It makes encounter possible. It makes communication possible. It makes knowledge, access to reality and to truth, possible. And insofar as it makes knowledge possible, it makes freedom and progress possible. Evil hides. Light, then, is also an expression of the good that both is and creates brightness. It is daylight, which makes it possible for us to act. To say that God created light means that God created the world as a space for knowledge and truth, as a space for encounter and freedom, as a space for good and for love. Matter is fundamentally good, being itself is good. And evil does not come from God-made being, rather, it comes into existence through denial. It is a “no”. At Easter, on the morning of the first day of the week, God said once again: “Let there be light”. The night on the Mount of Olives, the solar eclipse of Jesus’ passion and death, the night of the grave had all passed. Now it is the first day once again – creation is beginning anew. “Let there be light”, says God, “and there was light”: Jesus rises from the grave. Life is stronger than death. Good is stronger than evil. Love is stronger than hate. Truth is stronger than lies. The darkness of the previous days is driven away the moment Jesus rises from the grave and himself becomes God’s pure light. But this applies not only to him, not only to the darkness of those days. With the resurrection of Jesus, light itself is created anew. He draws all of us after him into the new light of the resurrection and he conquers all darkness. He is God’s new day, new for all of us. But how is this to come about? How does all this affect us so that instead of remaining word it becomes a reality that draws us in? Through the sacrament of baptism and the profession of faith, the Lord has built a bridge across to us, through which the new day reaches us. The Lord says to the newly-baptized: Fiat lux – let there be light. God’s new day – the day of indestructible life, comes also to us. Christ takes you by the hand. From now on you are held by him and walk with him into the light, into real life. For this reason the early Church called baptism photismos – illumination. Why was this? The darkness that poses a real threat to mankind, after all, is the fact that he can see and investigate tangible material things, but cannot see where the world is going or whence it comes, where our own life is going, what is good and what is evil. The darkness enshrouding God and obscuring values is the real threat to our existence and to the world in general. If God and moral values, the difference between good and evil, remain in darkness, then all other “lights”, that put such incredible technical feats within our reach, are not only progress but also dangers that put us and the world at risk. Today we can illuminate our cities so brightly that the stars of the sky are no longer visible. Is this not an image of the problems caused by our version of enlightenment? With regard to material things, our knowledge and our technical accomplishments are legion, but what reaches beyond, the things of God and the question of good, we can no longer identify. Faith, then, which reveals God’s light to us, is the true enlightenment, enabling God’s light to break into our world, opening our eyes to the true light. Dear friends, as I conclude, I would like to add one more thought about light and illumination. On Easter night, the night of the new creation, the Church presents the mystery of light using a unique and very humble symbol: the Paschal candle. This is a light that lives from sacrifice. The candle shines inasmuch as it is burnt up. It gives light, inasmuch as it gives itself. Thus the Church presents most beautifully the paschal mystery of Christ, who gives himself and so bestows the great light. Secondly, we should remember that the light of the candle is a fire. Fire is the power that shapes the world, the force of transformation. And fire gives warmth. Here too the mystery of Christ is made newly visible. Christ, the light, is fire, flame, burning up evil and so reshaping both the world and ourselves. “Whoever is close to me is close to the fire,” as Jesus is reported by Origen to have said. And this fire is both heat and light: not a cold light, but one through which God’s warmth and goodness reach down to us. The great hymn of the Exsultet, which the deacon sings at the beginning of the Easter liturgy, points us quite gently towards a further aspect. It reminds us that this object, the candle, has its origin in the work of bees. So the whole of creation plays its part. In the candle, creation becomes a bearer of light. But in the mind of the Fathers, the candle also in some sense contains a silent reference to the Church. The cooperation of the living community of believers in the Church in some way resembles the activity of bees. It builds up the community of light. 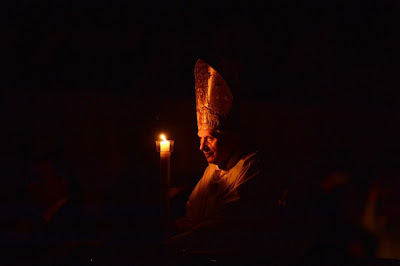 So the candle serves as a summons to us to become involved in the community of the Church, whose raison d’être is to let the light of Christ shine upon the world. Let us pray to the Lord at this time that he may grant us to experience the joy of his light; let us pray that we ourselves may become bearers of his light, and that through the Church, Christ’s radiant face may enter our world (cf. LG 1). Amen. "In Times of Trial, We Are Not Alone"
"Why In the World Would We Call This Day 'Good'?" "Let Us Ask the Lord To Draw Us Into This 'Yes'"
"Is Disobedience A Path of Renewal?"